My problem is that there is not enough memory in the required partition to perform the update, so no I wont install the update! And yes I’ve tried a few ways to change the partition but to no avail… Ideas welcome. I had exactly that problem on one machine with tight storage. It was actually a VM, so I could have expanded it, but I noticed that Windows offered me a “use external storage” option. I connected a USB disc and invited it to use it - upgrade worked perfectly. The only slight gotcha is the amount of space needed on the external disc is rather more than the amount it tells you it needs extra on the main disc. So if it says it needs another 500MB don’t expect to solve the problem with a 1GB USB stick. IIRC it wanted about 10GB on the external disc. Anyway, nice to know the external option is offered as this upgrade needs to fit onto a 32GB eMMC partition in the tablet which is running quite full at present. I am in exactly the same boat as you with the 1803 update on my Dell AIO PC, which fortunately is not my main work horse in the shack. All I can access is keyboard nationality and then it all grinds to a halt - the same as you. Cannot get to a restore point. Trying various things from the limited choices available in the menu given (which I haven’t seen before) but at present the machine is kaput. 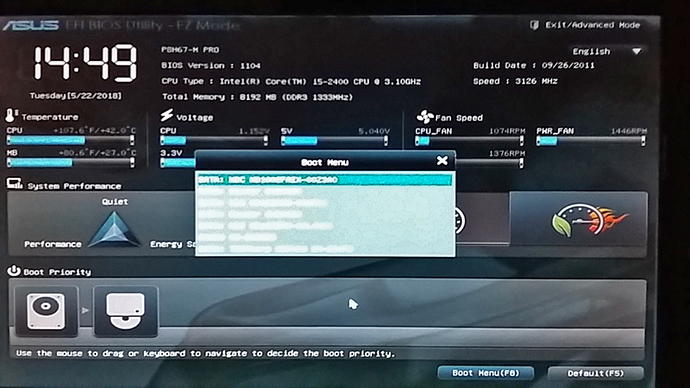 I will look into the BIOS if I can get to it. to see if Windows 1803 update has decided to move the operating system to a different partition on the hard drive. If I get a fix I’ll let you know - but like you I am busy, but preparing for a holiday in my case rather than returning from one! Hammer back in the toolbox! Most of my update went fine, the Open with… options are reset to those Windoz wants you to use, sorted. Computer has been awake all night and hasn’t been to sleep like normal, will be sorted. Yes, maybe, but it was another suggestion to try, I think all my machines over the last 28 years have been set from the BIOS. But it could depend on the MB. Also I have a 1TB C: drive which shouldn’t have caused space problems. Anyway, I’m sorted and happy. Best of luck to the rest. There’s a thread running on answers.microsoft.com which looks like a close match for these problems. Search for “Windows 10: Update 1803 failed - leaves laptop machine unusable”. I’m not sure I fully understand it but it sounds like the update may trash a machine with an old installation in which the system reserved partition is too small. It might be time to restore from the backup you took before doing the upgrade (sorry, couldn’t resist). Reinstallation might be the easiest way out, though I know it can be a pain to have to reinstall applications. A “repair” installation ought to preserve personal files, though I would hope that you really do have those backed up anyway. Quite right Martyn but I was not invited on the relevant PC to do anything other than upgrade & restart or upgrade and shut down as far as I recall. My Windoz laptop gave me a full page warning and invited me to go ahead or wait, according to how busy I was. I was not busy so went ahead and it seems to be fine apart from the extremely noisy psu unit which I do not think I can blame on MS. Any important work I have rescued using Linux. Thanks for the tip; I failed to find that one. I do have the “do a windows backup” before you start using the PC; apparently useless. I am in exactly the same boat as you with the 1803 update on my Dell AIO PC, which fortunately is not my main work horse in the shack. Very sorry to hear that Phil. Your symptoms seem identical to mine; with persistence I reached the command line so could attempt to use some MS repair tools. However they report that the disk is locked. Let us hope we can sort it out tho it seems like it is not a major issue for either of us (my big pc, so the one with the picture editing screen) it is a b… nuisance and a waste of time. I have now followed up Martyns link. MS DON’T KNOW WHAT TO DO EXCEPT WIPE THE HDD AND START AGAIN. After reading the link Martyn provided: "There’s a thread running on answers.microsoft.com3 which looks like a close match for these problems. Search for “Windows 10: Update 1803 failed - leaves laptop machine unusable”. I’m not sure I fully understand it but it sounds like the update may trash a machine with an old installation in which the system reserved partition is too small." and after reading comments from Win 10 users who had spent days trying to resolve the same issue as Rod and I have, I rang Dell. The all in one PC I have is less than a year old and under warranty, however the software isn’t. I suspect the Win 10 operating system may have been installed on a small partition when the PC was manufactured and because of that it was unable to process the Win 10 1803 update making the PC unbootable as was suggested by Martyn. My problem is I don’t have a Win 10 recovery DVD as Win 10 was preinstalled at the Dell factory - I’m not fully conversant with boot up processes but the machine is not using the old style BIOS but boots by a process called UEFI (Unified Extensible Firmware Interface) so the machine will not as it stands be made to read anything from its DVD drive. Hence my call to Dell. I now have a download from them of Win 10 on a DVD-R disk ready for installation tomorrow at around 1.00pm, when I have a up to a 2 hour telephone appointment slot with their software engineer on the phone to restore my machine to a working condition (I hope). There will be the usual software packages to reload after that, but fortunately all can go back on at no additional financial cost to me, just time. So I warn anyone reading this you will probably be lucky installing this update, but you may not be and it could cost you money and time fixing it, so be aware. evening I can report back to confirm that I have a functioning Dell PC. Very interesting, Phil. Thanks for passing it on. My PC is also a Dell but second hand and was Win7 with the original Win 10 update. It worked very well until MS screwed it up. This is, in fact, the same machine in use now but running Linux. I would like to say that I will never bother to try to recover Win doz but so much stuff requires it and the workarounds are not always straightforward. Hope all goes well with your re-installation and best wishes for an enjoyable holiday. Cheers Rod - I don’t normally knock Microsoft and have used their products in PCs since I got a 386 in 1991. First time I have had to pay for specialist help on a computer in 27 years this. Maybe I shouldn’t moan too much about it! I wouldn’t know where to start with Linux as an operating system but I know a lot of my software will only function within the Windows 7 or 10 operating system. Main shack PC,. th eone I am now typing on is remaining on Win 7 until I am forced to update it. Sorry to hear of the problems several people are having. I have never been a Microsoft fan, in fact for a long time i was in the hater camp. Over the last few yeras though MS have done the right things in general, getting the quality of their code up to where it should have been 20 years ago. Out of this experience - my suggestion would be to add a recovery partition to your systems. If you had, had one (it contains several tools plus the ability to do a recovery or a full re-install) it would most likley have helped in these cases. Many people when they buy a laptop have a recovery partition as part of the build but that does not get updated over time and should a major update like windows 7 or 8 to windows 10 be made, the old recovery partition is of limited use a new Windows 10 one is needed. It’s rare that a PC is supplied with the OS install DVD these days. Often one can be created from the HDD but people don’t do it. An install DVD can often act as a repair/recovery tool. Creation of the recovery partition is well documented on the web and is a supported action by Microsoft. Of course if you don’t have enough disk space to do an update, you wont have enough space to add a recovery partition - unless there is an old partition there that you can possibly re-use or you can resize the partitions to make enough room. Is this an action for a “normal” user? Probably not. It’ll be interesting to see if Dell update or add a Windows 10 recovery partition on your laptop Phil. The fact that many systems now have UEFI boot systems makes life somewhat more complex in this area compared to the old boot methods. The other thing, the experiences documented here should also underline for us is the need to have an external backup of all important data and documents. I realise that it is cold comfort to learn this now, but Windows 10 can create its own recovery media. Start typing “recovery drive” into the start box and you should be led to the “Create a recovery drive” dialogue. It will ask for a USB stick (at least 8GB) which it will turn into a bootable recovery drive. Obviously you need to do this before your machine breaks and keep the USB stick safe to use when it does. Often you will find that a new machine comes with advice to do this in the instruction manual. Of course the manual no longer comes in the box either; you’re expected to download and print your own. So this important precaution tends not to be noticed. You’ll do this after your machine is repaired, won’t you? However my laptop has Linux and Win and gets a similar imaging backup to a different external disk. The times I’ve needed something, those backups have worked. For people who don’t live and breathe computers and hardware all day, this must be a complete nightmare to manage irrespective of whether it’s Windows, Linux or Apple stuff. Mrs . FMF has often complained because my browser is locked down with script, ad and tracking blockers. Her words are “how are normal people meant to know” and there is no easy answer. No help to Rod or Phil, but my Linx 1010 is due this upgrade and I’m putting it off till I get back from FN. I did check and 1803 seems to install on the Linx1010 without issue as long as you have about 9GB space on the drive. The last big update also was painless apart from breaking all audio which was fixed by uninstalling the audio drivers and reinstalling them from Windows Update. Certainly will for sure Martyn - thanks! Good Idea, doing the same on my Acer tablet! After spending almost an hour with the man from Dell software support and trying every boot option under the sun he and his supervisor have declared that there is a hardware fault, so the machine is going back to Dell via UPS for repair under warranty. Warranty runs until July 18th 2018. Machine purchased last July new from Amazon. Ran perfectly before the Microsoft 1803 Windows 10 update! While it may seem unlikely, hardware failures can occur during a system upgrade as parts of the system are under pressure more than normal. You were lucky this happened now if the Windows update had come only in August, the system would no longer have been in warranty! So in a way the Windows update may have saved you some money! It sounds as if I have been quite lucky (seems the most appropriate word) with my desk top, laptop and netbook all upgrading successfully although the :C: drive space has been tight. Laptop and desk top just have 256gb SSD for C:. My pet hate is windoz focus on putting everything into C:. That belongs to the dark ages. I re-map as much as possible elsewhere such as documents to G: and pictures to H: e.t.c but still so many apps want to use C:/users - why? This architecture is broken and it is time that MS changed it. Windows has been able to be installed to drives other than C: for several years. The problem as you touched on is that program authors sometime hard code C: paths into their applications rather than referring to the available system variables and APIs to get the correct locations. Windows has been able to be installed to drives other than C: for several years. Yes but that is yet another PITA. Not if you do a scripted install, but for the average (non IT professional) user, that’s not really possible. The key point I think is that any OS has to have some of it’s code on the partition that the MBR or a boot manager boots to. The actual drive letter is less important. Windows even using the standard user install (advanced options) allows you to put the OS across different partitions (and hence drive letters). The problem remains that if program author choses to hard code C: into their creations, they will only work when C: is the system drive.